A recent youtube video by jörg piringer that scrolls through "all" 49,571 Unicode characters in 33 minutes and 16 seconds (25 characters a second) has been doing the rounds, but I'm afraid that I was not impressed. The 49,571 characters in the video only cover the BMP, and even then it is 5,000 characters short, missing out most of the characters that have been added to Unicode over the past ten years, and missing out entirely some scripts that have been in Unicode since Year Zero. 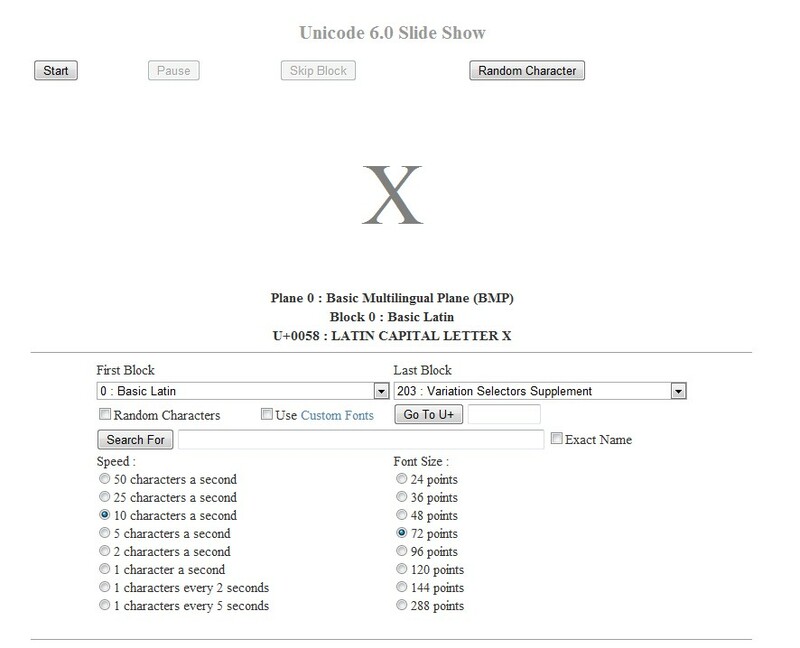 Unicode version 6.0 (released October 2010) actually defines 109,384 characters (109,244 graphic and 140 format characters). How many of them you are able to see depends upon your operating system, your browser and whether you have additional fonts installed covering obscure and recently encoded scripts and characters (and whether your browser will actually apply those fonts or not). On my Windows 7 SP1 machine, with no additional fonts installed, I can see 95,372 of these 109,384 characters (87.1% coverage of total number of characters, but only fully covering 66 out of 203 blocks, and 85 blocks with no coverage at all).